Many pediatric life-limiting diseases include a neurological developmental component. Parents of these children are often left to interpret their child’s physical symptoms and emotional desires in order to determine medical interventions and arrive at goals of care. However, in some instances, the child him or herself is able to participate in decision-making and participate in determining goals for their care. This past winter, CPN spoke with Marci, mother of twins Becca and Ian. Ian was diagnosed at the age of 9 with Pontocerebellar Hypoplasia Type 1A and passed away on September 15, 2016. Throughout his illness journey Ian was able to participate in critical decisions even at times considering if he was ready to go to heaven. Marci (with Ian’s twin Becca) talks openly about having a child who could understand the road ahead. CPN: Ian’s disorder was physically progressive in nature and yet mentally he had the capacity to understand what was happening. How did Ian handle that? Marci: Ian’s ability to understand what was happening to him and make medical decisions remained constant throughout his lifetime. He understood at an age appropriate level how his body was changing and what it meant. When he was very young, prior to diagnosis, his reaction to what was happening was mostly frustration. His first regression was loosing control of his legs, moving from walking to walker to wheelchair. I can remember a 3-4 year old Ian sitting at the base of the stairs, yelling at his legs to start working. When we would offer to help, he would defiantly tell us he wanted to do it himself. 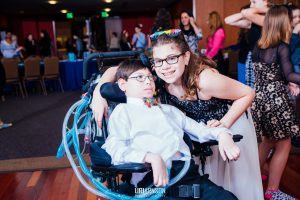 Before his diagnosis, we tried to quell his frustration by telling him we understood his frustrations and that with the help of the doctors, we would figure it out. Once we had the diagnosis, and Ian understood what was happening, he gave into our help but always kept that sort of pre-teen attitude that let us know it was with some reluctance. CPN: Did Ian ever express that he was frightened by what was happening to him? Marci: Ian never really expressed being scared. Just frustration at his limitations. Then, after his diagnosis and when he understood he was going to heaven, he expressed more of a worry and concern for Brian, Becca and me. He worried that we would not be ok when he was gone. Ian was an old soul – always needing to know where we were especially, Becca. He watched the clock when she was at school and felt better when he knew where she was. And when we talked about heaven, he often wanted Becca to be part of the conversation. Becca: Actually, I do remember one time when Ian showed he was scared about dying – at one of our last meetings. I told him a story about Peter Pan leading children safely up to heaven. It seemed to make him feel better. CPN: You talk a lot about family meetings as place to discuss decisions. Can you tell us about a major medical decision that included Ian and Becca in the process? Marci: In 2013 when Ian was 10, he was hospitalized. During his hospitalization he was intubated and despite many tries he could not be extubated successfully. It took us 3 weeks to decide if we were going to trach and vent him. We talked to doctors and other parents whose children were trached. We even talked to another teenager who was trached and vented. Finally, we talked to Ian, explaining the medical procedure. We told him we either needed to do this or it was time to go to heaven. And we asked him if he was ready to go to heaven. He told us he wasn’t ready to go to heaven and he wanted the tube. That night we had the same conversation with Becca, trying to explain how a trach/vent would change Ian’s life and that not doing the procedure would mean he would go to heaven. She said she knew it wasn’t time yet – he was too young to go to heaven. I think that involving Ian and Becca in the decision was the right thing. For Ian, it was his body and even though we had become experts in the disease, it was still his body. Even though parts of his body weren’t working, parts still were and he understood that better than we did. Including Becca in decisions gave her a sense of power over something that seemed so out of her control. We never put the decision on them but we know that including them empowered them. CPN: Did Ian have a feeding tube? Marci: He did have a feeding tube but we only used it for medicine. Ian really enjoyed eating. It was the last thing he had control over and we did not want to take that away from him. So we really only used it for nutrition a few times such as when he had surgery for his scoliosis. CPN: In April of 2014, Ian had his spine fused. Was he able to participate in that decision? Yes, when Ian had the surgery the curve in his spine was 80% and he was in a lot of pain. It was a lot harder to care for him – baths, changing his diaper all became harder and he was always uncomfortable. Of course we talked with Ian about the fact that he might die during the surgery but that the spine correction would make him more comfortable. A child-life specialist met with Ian, and two different doctors explained the process and risks to Ian, Brian and me. The hospice team came out too. Ian told us he wanted to be out of pain. CPN: Was there ever a decision where Ian really asserted himself? Marci: Yes, at one point Ian told us he did not want to go to the hospital anymore. We discussed what this would mean – that if he got sick we might not be able to care for him and he might die. He was adamant. The only time he ever gave in on this was when he wanted to attend a special sleep-away camp and the camp required we sign a release allowing them to take him to the hospital. CPN: Did the decisions ever get so big that you thought you should not include Ian? Marci: Not really. This was happening to him and we wanted him to know we were here to enable what he wanted. The one thing that we did not include either Ian or Becca in was Ian’s funeral arrangements. Brian and I wanted to get those done in advance and we met with our Rabbi 3-4 years before Ian died to work out all the details. I think that was the biggest decision we ever made without Ian. CPN: Did Ian understand that he was actively dying? Did Becca know instinctively? Marci: Probably but it happened so quickly at the end that even we didn’t truly know that the signs we were seeing were indicating end-of-life. It was a Friday and Ian was not eating but this would happen occasionally so we didn’t think much of it. That night, we had a conversation with Becca to let her know Ian wasn’t eating. She looked at us and said He is dying. We told her that she could not know that and to see how the weekend went. But still, I asked her if there was anything she would like to do with him. She requested a pajama day – this was something we did with them over the years. It is a day were we all stay home in our jammies, watch movies and eat lots of things we don’t eat regularly. She also requested a trip to a movie through an organization that we became affiliated with that arranges for special needs families to have private movie viewings. He did not eat on Saturday or Sunday but he was still alert, drinking and communicating. On Monday morning I texted the hospice nurse to make her aware that he had not eaten in three days. She adjusted her schedule to come on Tuesday instead of her regularly scheduled day, Thursday. It happened that Monday was a day off from school and I was able to arrange the movie. Becca, my mom, Ian and myself went to see Pete’s Dragon 2 at the theater where he laughed the whole time. The next day, I went to work but came home in time to meet the hospice nurse. When she arrived, we sat on the sofa and I updated her on what was going on an then she went upstairs to Ian’s bedroom to examine him. When she came back downstairs the conversation did a 180. She explained that Ian’s stomach was distended and his body was shutting down. I remember stopping her so I could call Brian and she could share her findings with both of us. Brian came home from work so we could both be there when Becca got home from school. We tried to sit her down to tell her what the nurse had said but all she did was stand in front of us saying No, I don’t want hear it. We explained that we did not have an exact timeline but it would only be days. We assured her that she could be with Ian at the end. Ian was trach’ed and we knew that even if she was at school we could get her home before we removed the trach. Wednesday, the full hospice team came out and we put a plan in place for keeping Ian comfortable. He actually had a pretty good day, sleeping a lot but interacting with us too. Over the years, Brian and I often asked Ian if he was ready to go to heaven and we asked him again that night. It was the first time he said Yes. We told to go – we would be ok. Over the years we had assured Ian that when he got to heaven all his body parts would be waiting for him and would work again. At 5:45 am, the nurse came into our bedroom to tell Brian and me that something wasn’t right with Ian. I remember Brian shaking and rubbing Ian to try and get him to wake up. I remember telling Brian to stop that he was not going to wake up– I knew Ian was not going to wake up. CPN: In listening to your story, it sounds like you had a great medical team with support from your nursing help, child-life specialists and your rabbi. Was there any one member of the team that you feel rose above the rest and was really critical in your decision-making and Ian’s care? Marci: Ian – it was always about him.